How to change settings for individual rows. A shortcut to set the max row width in pixels right in your layout. This lets you assign custom default settings for rows. If you remove unrestricted editing capabilities from certain user roles in Settings > Beaver Builder > User access, users with those roles will not be able to change row content width. See the article on granting user access. If you're comfortable with adding PHP to your child theme's functions.php file, you can customize row resizing behavior or disable the ability to set max content width. See the Related Article on customizing row resizing behavior for more information. Tip: See the Related Article on full-width and fixed-width rows for the basics of how row and content width works in Beaver Builder. Set row and content width for individual rows on the Style tab when you open the row's settings. 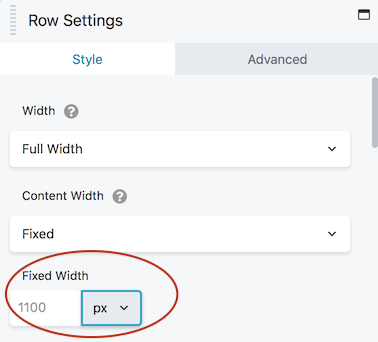 If row Width is set to Fixed width, you can set the maximum width for that row. As of Beaver Builder 2.2, you can set the max width in absolute units (pixels) or in relative units (either percent of viewport width or percent of the CSS parent setting). See the Related Article below for basics of CSS units. If row Width is set to Full width, you get an option to set Content width to Full width or Fixed, as shown in the following screenshot. If Content width is set to Fixed, you get the option to set the content max width. If either the row or content width is set to Fixed in row settings, you can change the row max width by moving the drag handle. Row drag handles appear on the outer edge of content boxes. When a row has one column, there's a row width drag handle on both sides, as shown in the following screenshot. If the row has two columns, the outer side of the content box is a row drag handle, and the inner side is a column drag handle, as shown in the following screenshot. You'll see a tooltip showing the max width in pixels as you drag. If you hold the Shift key down while you drag, the unit field changes to 10px instead of 1px. If you don't see a drag handle, it means both the row and column are set to full width in row settings. Your drag handle setting will appear in the Fixed width field in the row settings. When you click and hold the drag handle, the selection changes to include the entire row's content. In the following animation, clicking and holding the drag handle of one item in a multi-column row will expand to select the entire row's content area. 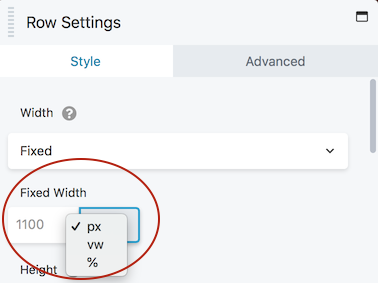 You can change the site-wide default settings for row width, content width, and max width in the Rows section of Tools > Global Settings. You can also change the default row margins and padding values. See the Related Articles for more details on how to set custom global default row widths in Beaver Builder.